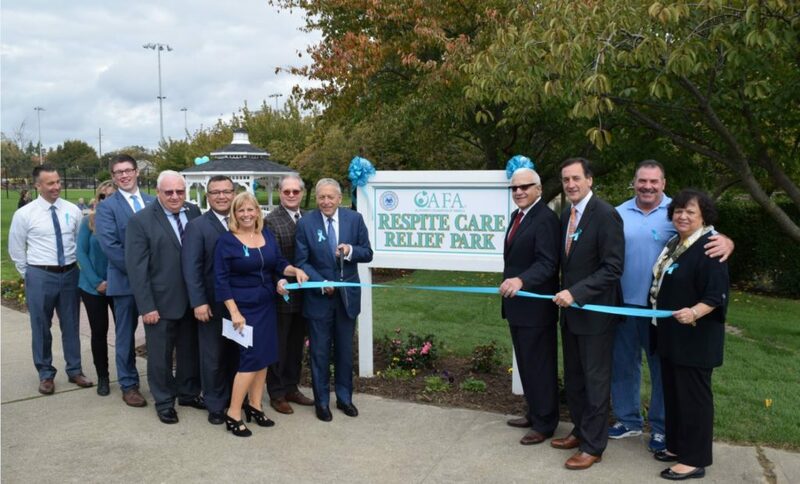 The Alzheimer’s Foundation of America (AFA) and the Town of Babylon officially opened a new respite care relief park to help those living with dementia and their caregivers. The park, located next to Babylon Town Hall in Lindenhurst, is the first of its kind anywhere in the country and will serve as AFA’s model for future sites across the United States. AFA provided the Town with $25,000 in grant funding to build the park. The Respite Care Relief Park includes educational information about dementia and Alzheimer’s disease, along with benches, a brick walkway, a gazebo and landscaping. Docking stations are also available where people can plug in phones to play music, which often aids in memory and brain stimulation. The park will enable a caregiver to have much needed relief and gain insight on avoiding burnout; building caregiver skills and a team of support; staying active and becoming an advocate. Caregivers will also be able to bring a loved one living with dementia to this peaceful outdoor setting. The new park is the next step in the Town of Babylon’s combined efforts with AFA to make the town more dementia friendly for residents. Previously, AFA and the Town have worked together to educate residents about Alzheimer’s disease, raise Alzheimer’s awareness, provide free memory screenings and hold dementia training programs for Town employees. AFA provided the grant funding with support from the Allergan Foundation.